Sure, it’s a novelty item. But someone might slap that on AK variant and hurt themselves. So….is THAT the shoulder thing that goes up? Don’t forget to sharpen it. That will damage a few benches, huh? Some RSO will insist on a sign. Nothing like gun accessories designed by people who don’t use or shoot guns! 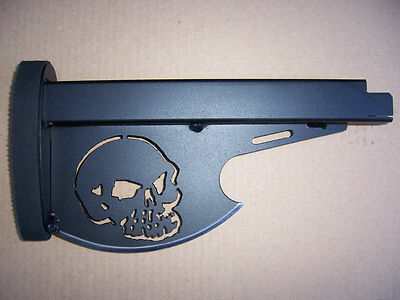 Anyone dumb enough to slap that on their gun is dumb enough to sue the manufacturer after they hurt themselves with it. I would hate to be the lawyer that has to explain that one to a jury because some fool used it on his gun and had to defend himself with it. . . . even if he only shot the attacker the jury would hang him. . .
i’d say its about as novelty as using an ak as your shtf gun. it kind of makes sense on an AK. not a KVAR AK, but a beater – say a Century International Arms. it’s just so right there. kind of like it should have been there all along on the soviet arsenal guns. definitely not for an AR, but an AK? soooo yes. The Russian Space survival kit had a machete that doubled as a gun stock. Looks more like a shoulder thing that goes *down*. Looks like just the ting to mount on a moderately realistic inexpensive airsoft AK with the intended use as wall art in someone fourteen year old’s wannabe ‘mancave.’ Other than that: Your guess is as good as mine. Finally! A firearms accessory that surpasses the pistol bayonet in terms of sheer gheyness! Not even a good ax — the pad at the end would interfere with the ax “biting”.